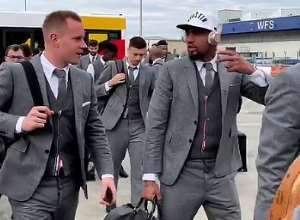 Ghana’s Kevin-Prince Boateng together with his Barcelona teammates were seen dressed in an expensive suit valued at £4,200 on their trip to Manchester. Barcelona are expected to play Manchester United at Old Trafford on Wednesday in their first leg of the Champions League quarter-final tie. Due to that, Barcelona players flew out of Spain on Tuesday to the English city for the game. Players of the Spanish giants were spotted immaculately dressed in grey Thom Browne three-piece suits ready to board their flight to Manchester. Boateng who has been named in Barcelona’s Champions League squad for the second time was also seen in the £4,200-priced suit together with his designer bag and a baseball cap. On board the plane, Kevin continues to share photos of himself in the plane with his headphones on to entertain him with music throughout the flight. Ernesto Valverde's side are expected to train at Old Trafford later on Tuesday before the game on Wednesday night.